Welcome to the website of Ireland’s largest supplier of X-ray accessories. Whatever your speciality, Diagnostic Imaging, Mammography, CT, MRI, PET, Radiation Therapy, Dentistry or Veterinary, we are committed to supplying the most complete, technologically advanced and proven products available. We hope you find this website useful and informative - just click here to contact us. 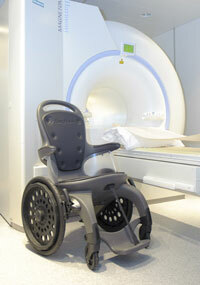 The EasyRoller is a new 100% plastic MRI Wheel Chair with NO metal parts. Easy to disinfect and can be used in a shower. Highly stable with wide comfortable seating, easy breaking and practically maintenance free. Safe up to 180kgs.